On April 21, 2015 Pre paid auto booth was inaugurated with fan fare at Central Bus stand, and today the said monument completes 2 years of its useless existence. 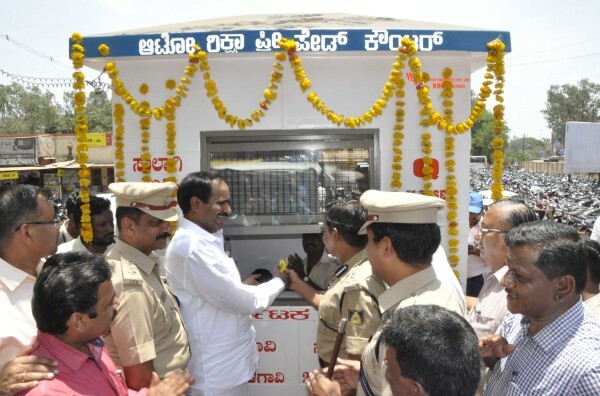 The prepaid auto booth at CBT (Central Bus Stand) was inaugurated today and DC N Jayram, SP Ravikante Gowda and Commissioner of Police S Ravi took the first ride. But this has turned into a monument of sorts and only the ASI will be able to have access to it in the near future. As many as 3 prepaid auto booth monuments were made none of them worked for they were inaugurated. Deputy Commissioner N Jayram has behind this Auto fare implementation but the RTO is not bothered at all and hence the Police also is not very involved in fining the Autos. May what it be, but the citizens of Belagavi are Thankful to the District authorities for building such great monuments and we hope they will also take up the task of the preserving of such monuments to protect them as originally as possible in their existing substance and to pass them on to future generations as “genuine” cultural heritage. Wow so nice monument. Tomorrow it become history and become rest room for dogs and pigs. It should be converted to a historical monument and people should be charged to see it.